The Minnetonka Public School District #276 is an award winning district serving families within 10 neighboring communities: Minnetonka, Chanhassen, Deephaven, Eden Prairie, Excelsior, Greenwood, Shorewood, Tonka Bay, Victoria, and Woodland. This reputable district values quality and places a strong emphasis on personalizing every student’s educational journey. and Scenic Heights Elementary. Clear Springs Elementary serves families Minnetonka and Chanhassen. Deephaven Elementary serves families in Deephaven and Shorewood. Excelsior Elementary serves families in Chanhassen, Excelsior, Greenwood, and Shorewood. Groveland Elementary serves families in Minnetonka and Groveland. Minnewashta Elementary serves families in Chanhassen, Shorewood, Tonka Bay, and Victoria. Scenic Heights Elementary serves families in Minnetonka and Eden Prairie. Each elementary school enjoys a family oriented atmosphere and a creative approach to teaching and learning. Minnetonka and Deephaven and enrolls about 1,000 students each year. Minnetonka Middle School West is located in Excelsior and enrolls about 900 students each year. All ten of the districts communities are served by these two schools. Both schools have immense pride in their accomplished curriculum and wide variety of extra curricular activities. Each year, more than 80% of their middle school students take part in at least one after school activity or sport. 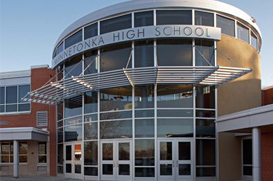 The entire district is served by one award winning high school: Minnetonka High School. This high-performing high school serves students in grades 9 through 12 and has been recognized on multiple occasions for its academics and sports. Minnetonka High School offers a curriculum of great extent. Art, business, computer science, family and consumer science, health, language arts, mathematics, music, physical education, science, social studies, technology and world languages including American Sign Language, Chinese, French, German and Spanish are available for every student. Minnetonka High School also offers a wide range of advance placement courses for students who wish to receive college credits. Nationally, and state wide, Minnetonka students perform exceedingly well on standardize and state-wide testing. Not only does Minnetonka High School prepare their students for a higher education but also prepares their students for life.